Jane and I are very sad to hear that Excalibur Resident Ted Carter died at the end of last week. Here are a few words about our prefab friend and a video I shot in 2013. I was privileged to know Ted through Trevor’s regular computer class at the community centre and the Prefab Museum. He was a familiar and comforting presence at the museum, as well as a serial leg-puller usually ribbing me about smoking (he could always tell)! Ted was a reminder of a time when if something was broken you didn’t throw it away but asked an expert who not only diagnosed what was wrong with it but could make it work again. Immortalised on Keara’s design for the museum tea towel, we won’t forget Ted’s friendship and the time we spent with him. On Saturday, I was deeply saddened to hear about Ted Carter’s death. He was one of the Excalibur Estate prefab resident. He had been living in his prefab since the 70s. I only met him in 2012 at an event the TMO (Tenants Management Organisation) was hosting in its office. At some point he went out to smoke cigarette and was kind enough to talk to me on the camera about Lewisham Council and how the borough was badly treating the Excalibur Estate residents. 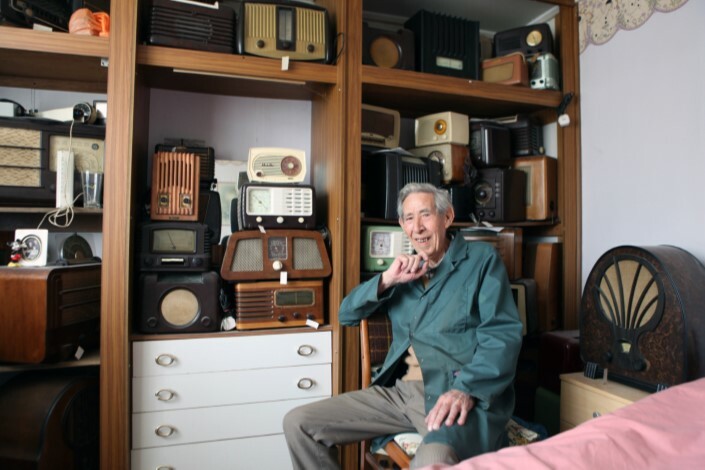 The next time I saw him, he showed me his prefab on Ector Road, his shed which was a radio workshop and his two bedrooms which looked more like museum rooms! He had a passion for repairing old radios. Among his collection, there were a few dancettes and old black & white TVs which looked like fish-eyed screens to me! I spent a lot of time with Ted in his prefab, talking about the estate, the war but also about other things, like France. He liked going there and had a son near Angoulême. When we opened the Prefab Museum at 17 Meliot Road, in March 2014, he probably was the Excalibur resident who came the most to visit! I don’t think he missed one open days. He almost always brought something to give to us or show us like old vintage magazines, press cuttings. He even lent us a vintage record player. There was always someone he would chat to and liked his cup of his tea with a piece of cake. I was a bit vexed he didn’t like mine actually, “there are too many eggs in your cakes, they taste like pasta!”. I also remember he used to come towards the closing time of the museum, knowing we’d stay another 1 or 2 hours to enjoy his company. When we closed the museum, after the arson attack we were victims of – actually, we presume the fire was set to the record player to blame an electric fault -, I saw Ted less but still went to visit a few times. Last time I saw him was last August: he was going to have lunch with his friend Linda.